Here in Arizona, Praying Mantids (Order Mantodea) are often found lurking near lights at night during August and September (mantids is the plural for mantis). There are a number of species of Praying Mantis found here in Arizona, and depending on the species, they are brown, yellowish, or green-colored like this Praying Mantis that I spotted outside of my kitchen window one evening. Praying Mantids are highly predacious, and their prayerful-looking front legs are modified into raptorial graspers that are used to capture their insect prey. I observed this large, green Praying Mantis capture a small red and black insect and immediately begin eating the doomed insect's head while it was still struggling in the Praying Mantis' relentless grasp. Besides powerful front legs, Praying Mantids also have excellent vision with their two large compound eyes and three smaller simple eyes between them. All of the other green Praying Mantids that I've seen have had green eyes, so I was surprised to see this one's unusual black eyes. 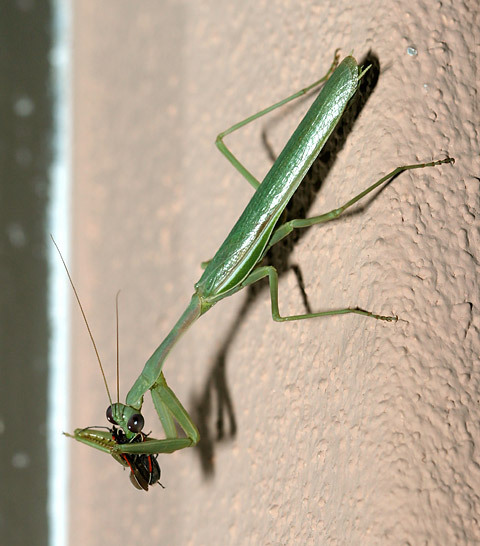 Despite their fearsome appearance, Praying Mantids are completely harmless to humans and are actually highly beneficial because these efficient hunters help control insect pests.